On the site of a former garage, this contemporary building takes on the challenge of performing a transition between a 4-storey building and a corner plot with only the ground floor.The building follows the row of houses and then pivots to reveal a party wall clad exactly like the street facade. The way the angle is processed gives a feel for the depth of the block behind. 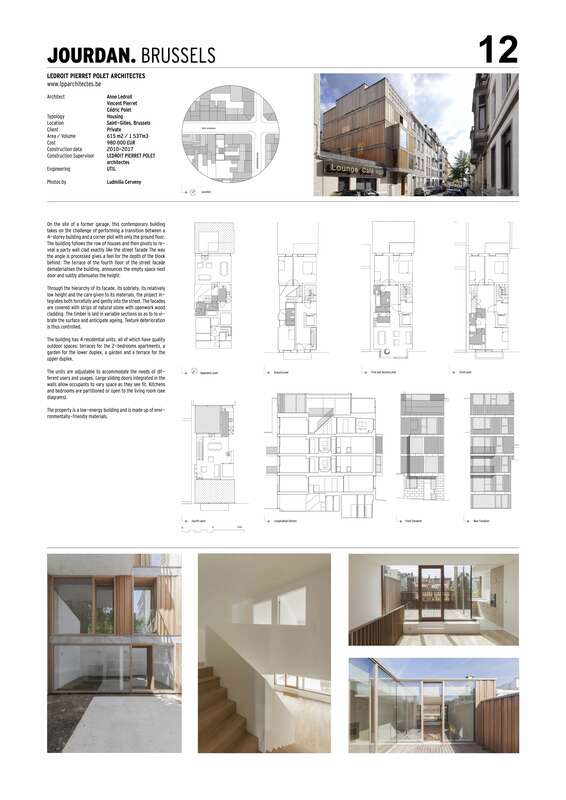 The terrace of the fourth floor of the street facade dematerialises the building, announces the empty space next door and subtly attenuates the height. Through the hierarchy of its facade, its sobriety, its relatively low height and the care given to its materials, the project integrates both forcefully and gently into the street. The facades are covered with strips of natural stone with openwork wood cladding. The timber is laid in variable sections so as to to vibrate the surface and anticipate ageing. Texture deterioration is thus controlled. The building has 4 residential units, all of which have quality outdoor spaces: terraces for the 2-bedrooms apartments, a garden for the lower duplex, a garden and a terrace for the upper duplex. The units are adjustable to accommodate the needs of different users and usages. Large sliding doors integrated in the walls allow occupants to vary space as they see it. Kitchens and bedrooms are partitioned or open to the living room (see diagrams). The property is a low-energy building and is made up of environmentally-friendly materials.